For over 30 years, Kaus has established themselves as an insurance company for any situation. While they focused primarily on selling insurance through regional agents in the past, they wanted to start selling directly to (primarily younger) consumers through a responsive, online platform. This project was a capstone project completed during Designlab’s UX Academy. Develop a responsive e-commerce website (compatible on mobile, tablet, and desktop) where consumers can easily browse, get a quote, and purchase insurance coverage. 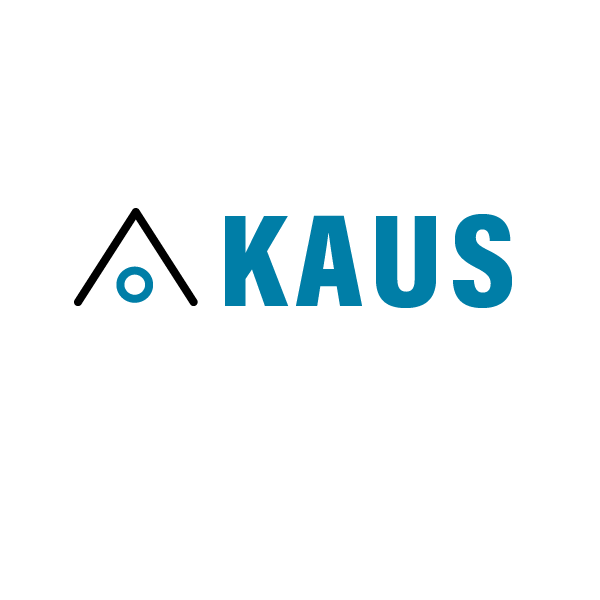 I also refreshed Kaus’ logo and branding to reflect the changes made to the website. 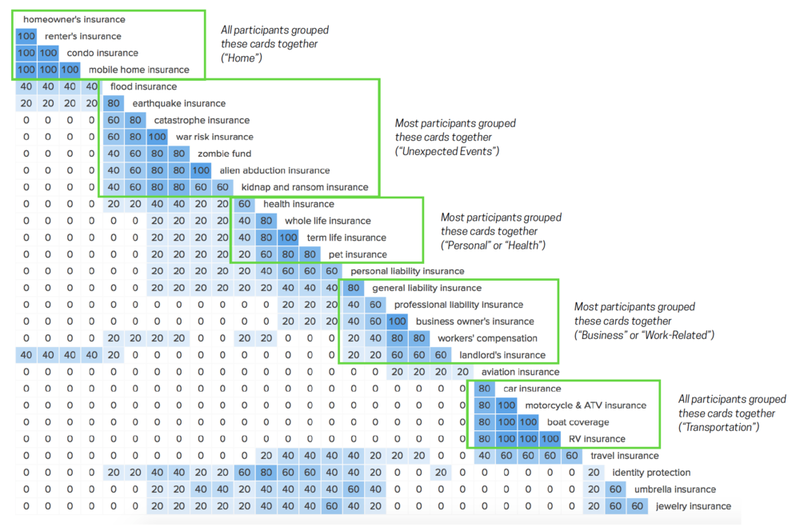 I aimed to identify behaviors, pain points, and goals of individuals looking for insurance online. 50% of consumers begin their insurance research online. 40% of insurance research time was spent on mobile devices. 25% of study participants used mobile devices exclusively while researching. However, the study found that very few insurance-related conversions happened on smartphones, despite them being a critical element in the research process. 36.4% of participants believed their insurance company’s website made it easy to do things such as get a quote or file/manage claims. Furthermore, 27.3% of participants claimed that they did not place high value on their insurance company’s website when considering the company. When discussing pain points with insurance companies, a couple participants expressed frustration when using their insurance company’s websites: seemingly simple tasks such as paying bills or changing plan settings were difficult. This seemed to clash with the survey participants who claimed they did not place high value on their insurance company’s website being easy to use. When discussing overarching goals, participants hoped insurance companies would prioritize making customer service as smooth and easy as possible in order to save customers time and energy. When discussing online purchasing behavior, all participants claimed they prefer to both research and purchase insurance on their desktop rather than on mobile device. However, regardless of device, all participants felt comfortable buying insurance online and would prefer that over in-person. Olivia is meant to be a realistic representation of Kaus’ key audience segments. Her goals and needs reflect the goals and needs of actual potential customers. Kaus was smart to follow their instincts: people want to buy insurance online in order to save time (and energy). While they may be more inclined to actually purchase coverage on a desktop computer, they often research insurance companies on their mobile devices. This means Kaus’ website needs to perform equally well on both devices. People place high value on reliability and cost when considering an insurance company. They also expect the experience of dealing with insurance to be negative, so any opportunity I might find to delight customers through Kaus’ website should be prioritized in order to stand out from their competitors. 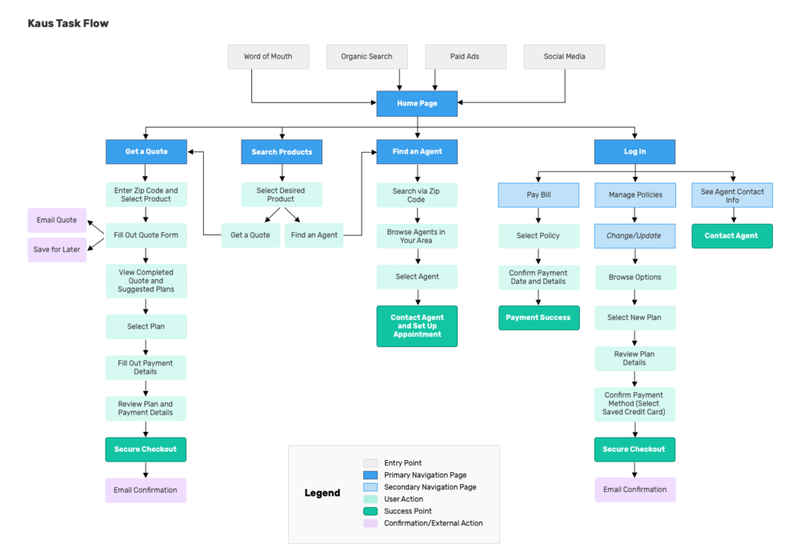 Use information architecture and interaction design methodologies to develop Kaus’ site structure and navigation. 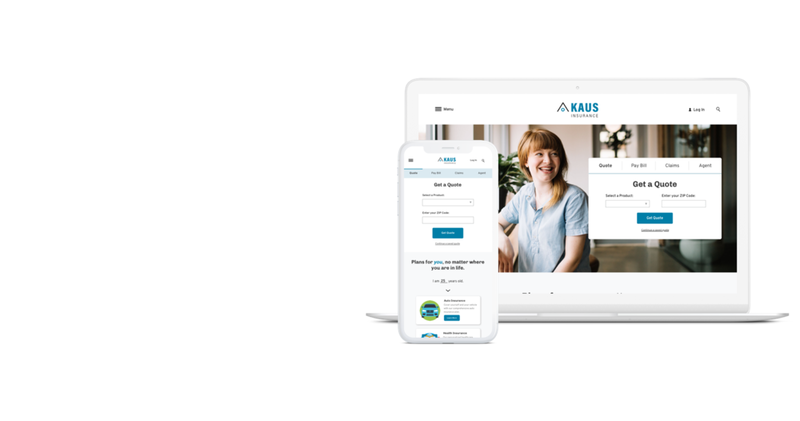 Ensure information is easy to locate and eliminate any pain points users may encounter when browsing through Kaus’ site. I learned how people naturally categorize and classify information into logical groups by administering a card sorting exercise. This was helpful when developing the site’s navigation. Identifying a main flow by which users will accomplish a task allowed me to narrow my focus on key screens throughout the site. During this step of the process, I wireframed the screens for Kaus’ home page, product page, and quote form. These were then utilized for preliminary prototyping. I ultimately chose to prototype Kaus’ auto insurance quote form on desktop after reviewing research findings. Since oftentimes this is the first interaction people have with an insurance company online, I wanted to ensure it was seamless before going to production. Before converting the wireframes to high fidelity UI designs, I redesigned Kaus’ logo and refreshed their branding. During Kaus’ rebrand, I played around with the idea of “Kaustronauts,” who I designed keeping Kaus’ cheerful and approachable branding in mind. 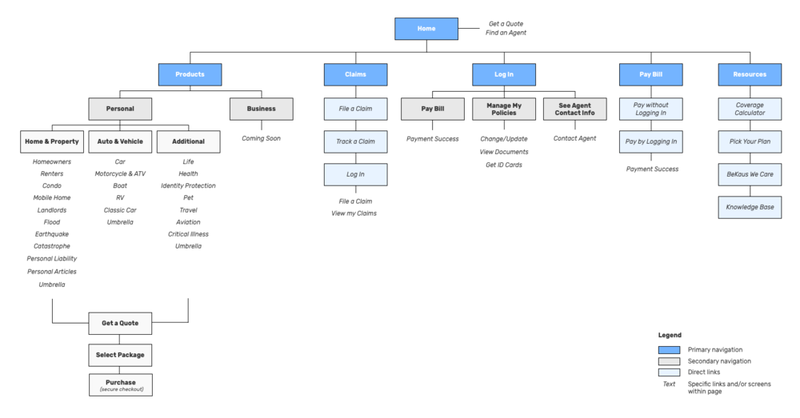 I envisioned them guiding customers through multi-step processes such as onboarding or filing claims. 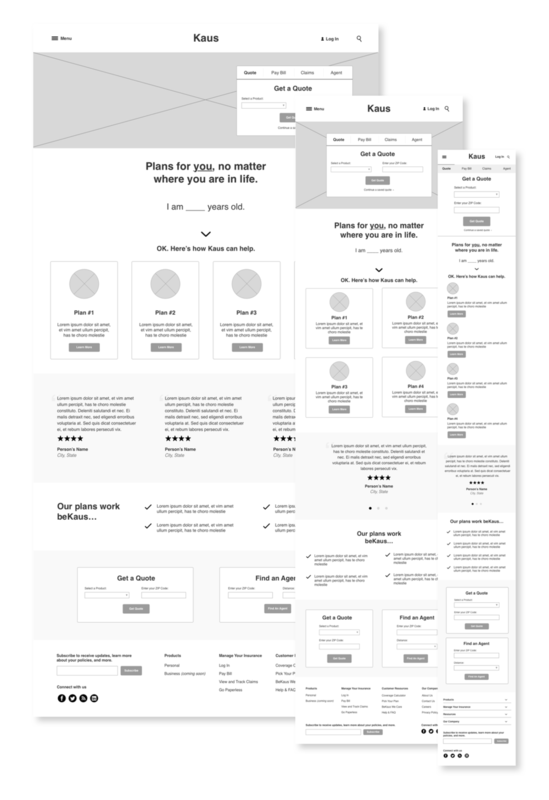 Before going into usability testing, I plugged in Kaus’ new branding to the preliminary wireframes. Test if users are able to successfully get a quote for auto insurance using high-fidelity prototypes of Kaus’ website. Observe the methods by which users decide to start the quote process. Collect feedback from users on ease or difficulty of quote process and how it might weigh on decision to purchase insurance from Kaus. The majority of participants followed the same path (which was also the “ideal” path I designed) to get a quote from Kaus’ home page. Only one participant followed a different path but still successfully got a quote. A couple participants commented on the experience being typical of any other experience filling a form out online (no surprises). Some participants found the loading screens between form pages distracting. All participants believed the process was simple and straightforward and experienced little to no issues during the test. 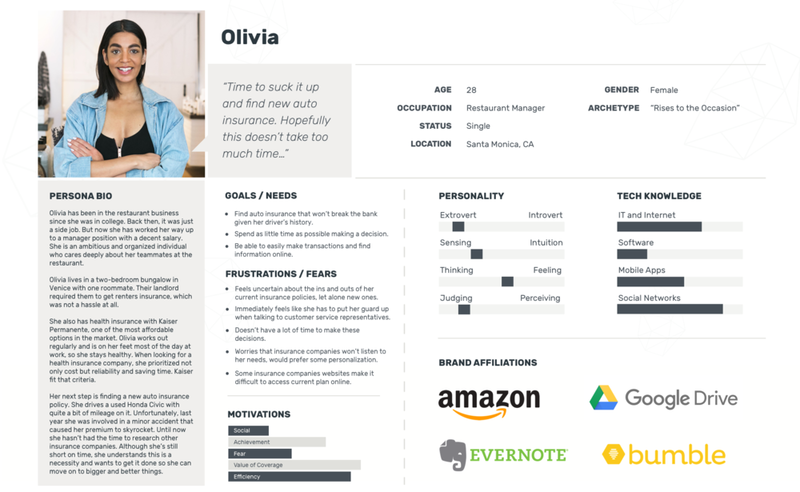 Final UI designs for the quote form, used during usability testing. I created an affinity map to sort and prioritize the successes, areas for improvement, areas of concern, and potential solutions based on usability testing results. Although this was a fictional company, I followed the same process that I would for any other UX project. Through extensive research and usability testing, I attempted to simplify the oftentimes convoluted experience of dealing with insurance companies online by ensuring the quote process was clear and straightforward. In future iterations, I hope to explore designing and prototyping an intuitive and easy checkout process once a user has decided to purchase insurance with Kaus. I believe this, in conjunction with a smooth quote process, would truly set Kaus apart from its competitors in the industry.